HOUSTON – Public health is personal for Nelson Gonzalez, an M.P.H. 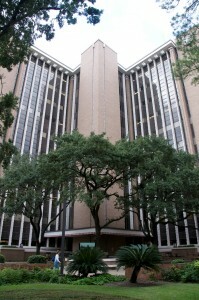 student studying epidemiology at The University of Texas Health Science Center at Houston (UTHealth) School of Public Health in Brownsville. Growing up in Edinburg, in the Rio Grande Valley of Texas, he saw friends and family struggle with heart disease, diabetes and other chronic health problems. Now, he’s working to address the gaping health disparities that plague border communities like his own. Gonzalez graduates in May 2018 with plans to attend medical school in Texas. When did you become serious about public health? As an undergrad at The University of Texas in Austin, I was majoring in biology, with plans on later attending medical school. I got into public health my sophomore year. Then, in my senior year, I did an internship at the Michael & Susan Dell Center for Healthy Living. I worked on the School Physical Activity and Nutrition Survey to collect data on childhood obesity in the Rio Grande Valley compared to the rest of Texas. I went to local schools to administer questionnaires to students, learned how to do a literature search and how to write a paper. I really enjoyed it. During my junior and senior year, I traveled to the Dominican Republic and Nicaragua on medical missions, where I helped diagnose and treat patients under the supervision of doctors. I took medical history, vital signs and dispensed medicine, as well as advised patients to boil their water before they drank it, things like that. The focus was on public health and prevention. It made me realize how important primary care is to a community. The summer after I graduated from UT Austin, I completed an internship at UTHealth School of Public Health in Brownsville, in conjunction with UT Health Science Center San Antonio, on the prevalence of peripheral artery disease in the local Hispanic population in the Rio Grande Valley. The Rio Grande Valley has one of the highest rates of lower leg amputations in Texas. Peripheral artery disease (a common circulatory problem that reduces blood flow to your limbs), is a big cause of that. I learned how to analyze data, and the basics of epidemiology. It was a great hands-on experience. Why did you choose UTHealth School of Public Health in Brownsville? I had intended to take a gap year after graduating from college and medical school, but Susan Fisher Hoch, M.D. (professor of epidemiology at UTHealth School of Public Health in Brownsville) who led the research project at UTHealth School of Public Health in Brownsville, suggested I enroll in the public health certificate program to see if I liked it. I had already established myself in the Rio Grande Valley with my internships, so it made sense to stay in the Brownsville area and continue to build my public health experience there. It has worked out great. After completing my certificate, I decided to get my M.P.H. I’m a research assistant for Dr. Fisher-Hoch, and I plan to apply to medical schools soon. We are developing a protocol to educate the local community about diabetic foot ulcers using a 3-D model of a foot, developed by a student at Rice who is also on the project. The foot has different inserts to show the progression of foot ulcers. Wounds heal slowly in people with diabetes. Foot ulcers can turn gangrenous or even cause total amputation. It’s a very serious issue for people with diabetes. I remember we saw one case, a man who had worked in construction who came into the clinic. He was diabetic. When he took his boot off, his sock was drenched in blood. He had been walking around all day with a nail in his foot. And he didn’t know because he had lost feeling in his foot. Our intention is to get people thinking about the very beginning of foot ulcers, starting from when they have small cuts, and to check their feet every day. We’re studying whether the intervention will impact foot care. I am also continuing my research on peripheral artery disease that I started during my summer internship in Brownsville. Now I am focusing on assessing the leg pain and function of those afflicted with the disease in the community. How have your experiences affected your career path? They have really helped changed my career perspective. The defining moment for me was doing those two internships. I had always wanted to be a cardiologist. After doing research in the Rio Grande Valley, and my experiences abroad, I now want to do primary care. I have seen the impact prevention has on a community level. After I earn my medical degree, I want to go back to the Valley and focus on primary care and epidemiology research, to improve border health. What advice would you give students thinking about a career in public health? As an undergrad, take an introductory course in public health, and see if you like it. Or work with your local health department, to get a feel for how public health works. Seek out hands-on experience whenever possible in the community. That’s what helped me decide what path to take.